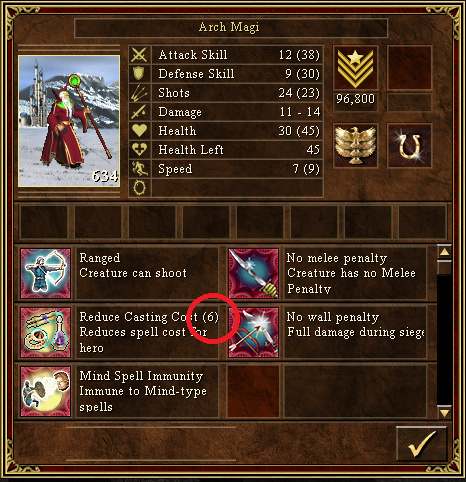 Is it normal for spell points to go negative? I checked if any artefact could have done it but nothing obvious there. Magic Arrow shows -2 and Haste -1. And they cannot be cast, it says something like “recites the incantation but they seem to have no effect”. Is this normal or a bug? Normally, spell points can’t be negative. But it is possible to get such values using some combined mods. I see. Well, after some VCMI update and some level up some of them worked just once. As in in the same battle I could cast Slow for 0 spell points and next round it went to -1. Is there an “easy” way to fix it? Write list of mods you are playing. Oki, So I have “In the wake of gods” without the Russian, Extra resolutions, high-res menu, creature bonus icons, New Terrains and Default templates. If I have to think about it I started to have the issue after adding the default template. But the error I noticed happened on a regular map, not generated. Ok, I uploaded the save. There are 2 files with about same size … I don’t know why. You can start a battle right away. Finally, I’ve found the cause! Normally, Arch Magi reduce 2 mana points. But part of WoG is stack experience module. It’s fine, with it game is harder than normal. But, Arch Magi at 9th stack level reduce 3 additional mana points, and at 10th level reduce additional 4 mana points. So overall they reduce 6 mana points and that’s why you have negative mana points. Solution for now? Just delete arch magi from army or reduce stack level with hiring new unexperienced arch magi. Wow, that is both awesome and annoying :)) I could try to modify the source myself, but I use pre-packaged PPA and I’d be more successful with C than C++. Not to mention I’m clueless about certain aspects of coding or versioning …Thank you very much for your effort!!! If you want to be one of the contributors, please join slack https://slack.vcmi.eu/ and talk with developers. They’ll tell you everything about this projects and making commits! You do not need big skills to work on VCMI, also I am happy to help any new contributors. If you wanna be better at programming, improve your C++ skills then it doesn’t hurt to try.